East Setauket, New York, U.S. He was born on April 18, 1911 in Lemberg, Austria now called Lviv, Ukraine. 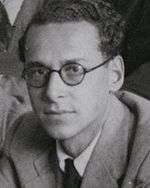 After beginning his physics studies at the University of Berlin, he earned his doctorate at Cambridge University in 1936, belonging to Magdalene College. In 1934, working at the Cavendish Laboratory in Cambridge, England he and James Chadwick, through what they called the nuclear photo-electric effect, established that the neutron has a great enough mass over the proton to decay. He moved to the University of Illinois in 1938. In the 1940s with his wife Gertrude Scharff-Goldhaber he established that beta particles are identical to electrons. He joined Brookhaven National Laboratory in 1950. With Edward Teller he proposed that the so-called "giant-dipole nuclear resonance" was due to the neutrons in a nucleus vibrating as a group against the protons as a group (Goldhaber-Teller model). He made a well-known bet with Hartland Snyder in about 1955 that anti-protons could not exist; when he lost the bet, he speculated that the reason anti-matter does not appear to be abundant in the universe is that before the Big Bang, a single particle, the "universon" existed that then decayed into "cosmon" and "anti-cosmon," and that the cosmon subsequently decayed to produce the known cosmos. In the 1950s also he speculated that all fermions such as electrons, protons and neutrons are "doubled," that is that each is associated with a similar heavier particle. He also speculated that in what became known as the Goldhaber-Christie model, the so-called strange particles were composites of just 3 basic particles. He was Director of Brookhaven National Laboratory from 1961 to 1973. Among his many other awards, he won the National Medal of Science in 1983, the Wolf Prize in 1991, the J. Robert Oppenheimer Memorial Prize in 1982 (shared with Robert Marshak), and the Fermi Award in 1998. Maurice Goldhaber's brother Gerson Goldhaber was a professor of physics at the University of California Berkeley; his son Alfred Scharff Goldhaber is a professor of physics at SUNY Stony Brook; his grandson (son of Alfred) David Goldhaber-Gordon is a professor of physics at Stanford. Goldhaber died May 11, 2011 at his home in East Setauket, New York at 100. In 2001, Brookhaven National Laboratory created the Gertrude and Maurice Goldhaber Distinguished Fellowships in his honor. These prestigious Fellowships are awarded to early-career scientists with exceptional talent and credentials who have a strong desire for independent research at the frontiers of their fields. ↑ Kenneth Chang (2011-05-17). "Maurice Goldhaber, Atomic Physicist, Is Dead at 100". New York Times. Retrieved 2011-05-18. Dr. Goldhaber was director of the Brookhaven lab from 1961 to 1973, overseeing experiments there that led to three Nobel Prizes. His most famous contribution to science’s basic understanding of how the universe works involved the ghostly, perplexing subatomic particles known as neutrinos. ↑ "Oppenheimer Prize awarded to Goldhaber and Marshak". Physics Today. American Institute of Physics: 89. September 1982. Bibcode:1982PhT....35i..89.. doi:10.1063/1.2915276. Retrieved 1 March 2015.